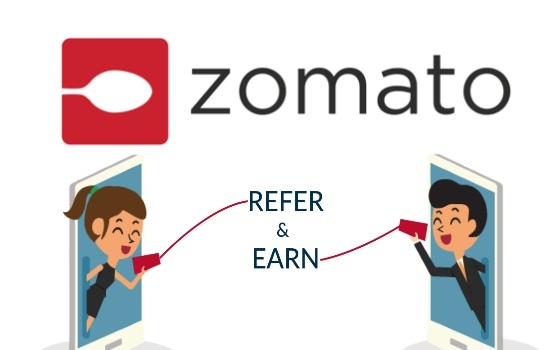 Zomato refer and earn program allows the user to receive Rs.100 on each referral. It is an amazing deal to enjoy meals in free. Here are the complete details. Zomato offers endless choices to foodies when it comes to cuisine choices, from sweets to savories. Whether you love to eat pizza, sandwich or momos, there is always something for everyone at Zomato. This online food delivering and restaurant finder web portal always helps foodies, whether it is a Friday night movie session or weekend get together with friends or family. And, the best part about Zomato is, no matter whether it is your first order or 100th order, you will receive a decent discount on your every order because there are Zomato Promo Codes and Coupons for both new and old users. And, the deals are getting better with Zomato referral code offer. The Zomato’s invite and earn program is an initiative taken by this website to bring every foodie to one platform. Here are the more details about this offer, please check out them. Zomato refer program helps the user to save money on the food from their favorite eateries. This deal helps the user to earn Rs.100 in their account on sharing their unique referral code to any of their any friend. The offer gets better when the person who has received the code signup into the Zomato using the code. As he/she can enjoy Rs.100 off on their first meal of Rs.300 or more. Further, the new user can also share their Zomato refer code to any of their friends. The advantages of the offer also applicable on their as well. Isn’t that amazing, so start sharing your unique code and enjoy meals in free. But remember one thing, a user can share their referral code only once to a number. Note: Zomato Gold Membership is an amazing way to enjoy free food and drinks in your favorite restaurant. To know about the details, plan, and prices of Zomato gold, then read out the article. Visit the Zomato website and app. Make an account on Zomato website and app. Note: If you want, to know about the procedure of How to Apply Zomato Coupons, then check-out this article. What is a better way than enjoying your favorite food almost for free by just inviting any of your friend to join Zomato by using your unique referral code? On, sharing the referral code you will receive Rs.100 in your account which you can further use it while making a purchase from the same account. On the other hand, your friend will also get a chance to take Rs.100 off on their first order of minimum Rs.300 after the signup on the Zomato by using your referral code.